46 (or more) written by a constitutional attorney! And these only includes his unconstitutional acts through 2014!! On Feb 20, 2014 I posted formal Articles of Impeachment of Barack Hussein Obama on this blog and sent copies to members of Congress. We have now confirmed that at least one, and possibly more, members of Congress have submitted the articles to the House judiciary Committee for consideration. Since a lot has happened since February I have prepared a third article that is posted here. Please feel free to forward this to your representative in Congress. (1) Article 2, Section 2 of the Constitution establishes the President as Commander in Chief of the United States Military. This requires him to use his power and authority to oversee the proper use of the military to properly protect and defend the people and territory of the United States against all enemies, both foreign and domestic. He is further responsible for using the U.S. military in a manner that is effective and protects members of the military and takes proper care of veterans. A. Imposing Rules of engagement on the active military in war zones that have unnecessarily endangered the lives of American soldiers. B. Allowed the leaking of classified information about U.S. military operations to the media in order to enhance his political image. Such leaks place the lives of U.S. soldiers in danger. C. Despite being informed in 2009 of problems in the Veterans Administration involving treatment of veterans, took no action improve the situation, but instead ordered the VA to spend a major part of its budget on green energy projects at VA facilities instead on veteran care. D. Endangered the lives of members of the American military and American civilians by negotiating with terrorists to trade five high level Taliban leaders in exchange for an American soldier who deserted his post and his fellow soldiers. In addition, he did the foregoing action in violation of Federal law since he did not provide the legally required thirty day notice to members of Congress of his intent to release prisoners from Guantanamo Bay. E. Continues to refuse to enforce immigration laws passed by Congress in violation of Article 2, Section 3 of the Constitution, and further has used illegal and unconstitutional Executive orders to grant amnesty or de-facto amnesty to illegal aliens currently in the United States. F. Has deliberately destroyed the morale and effectiveness of Border Patrol agents by interfering with their attempts to fulfill their oath of office and enforce laws legally passed by the U.S. Congress. G. By his deliberate actions encouraged parents of thousands of children in Central America to send their children, often unaccompanied by adults, across the U.S. border and then asking for billions of taxpayer dollars to care for these children. H. Ordered the Border Patrol and Department of Homeland Security to place thousands of these children on buses or planes and dumping them in communities around the country; often without any prior notifications to the local elected officials in these communities. I. Allowed the TSA to let these children, as well as possible teenage gang members and unidentified to fly in U.S. Airlines at taxpayer expense without proper identification required by Federal law. J. Has refused to respond to lawful requests by Governors of the southern Border States to close the Southern border to any further illegal immigration and has created a severe financial crisis for Border States and other states in order to advance his own political agenda. K. Has ordered the release of thousands of illegal aliens who have been convicted of serious crimes in the U.S. to be released and stay in the country after they have served their sentences. This violates the requirements of Federal law that such people be immediately deported. L. Ordered the immediate release of approximately 68,000 other criminals in Federal prisons that have been convicted of drug offenses. These actions endanger the lives and property of honest and law abiding American citizens that the President is legally and constitutionally required to protect. M. Has authorized the IRS, HHS, BATF, DHS, and EPA to propose new regulations not authorized by Congress that will adversely affect the rights of Americans protected by the First, Second, Fourth, and Fifth Amendments to the Constitution. I have prepared these updated formal Articles of Impeachment as a Constitutional lawyer. They are in proper legal form and all allegations are provable. They will be sent to Congress. Impeaching Barack Hussein Obama, President of the United States, for high crimes and misdemeanors. Articles of impeachment exhibited by the House of Representatives of the United States of America in the name of itself and of the people of the United States of America, against Barack Hussein Obama, President of the United States of America, in maintenance and support of its impeachment against him for high crimes and misdemeanors. In his conduct while President of the United States, Barack Hussein Obama, in violation of his constitutional oath to faithfully execute the office of President of the United States and, to the best of his ability, preserve, protect and defend the Constitution of the United States, and in violation of his constitutional duty to take care that the laws be faithfully executed, has willfully corrupted and manipulated the executive branch to increase its power and destroy the balance of powers between the three branches of government that is established by the Constitution of the United States. (1) Shortly after being sworn in for his first term as President of the United States, Barack Hussein Obama began creating new departments and appointing Czars to oversee these departments. These Czars were never submitted to the United States Senate for approval as required by Article 2, Section 2 of the Constitution. In addition, these Czars and the Departments have budgets that are not subject to being controlled by Congress as provided for by Article 1, Section 8 of the Constitution. He also made recess appointments when the Senate was not in recess and these appointments were struck down by the Supreme Court. (2) Article 2, Section 3 of the Constitution mandates that the President of the United States “shall take Care that the Laws be faithfully executed…” Barack Hussein Obama, in violation of his oath of office has repeatedly ignored this Constitutional mandate by refusing to enforce laws against illegal immigration, defend in court the Defense of Marriage Act (DOMA), and refusing to enforce Federal voting laws. A. Ordering the Environmental Protection Agency to implement portions of the Cap & Trade bill that failed to pass in the U.S. Senate. B. Ordering implementation of portions of the “Dream Act” that failed to pass in Congress. C. Orchestrating a government takeover of a major part of the automobile industry in 2009. D. Ordering a moratorium on new offshore oil and gas exploration and production without approval of Congress. E. Signing an Executive Order on March 16, 2012 giving himself and the Executive branch extraordinary powers to control and allocate resources such as food, water, energy and health care resources etc. in the interest of vaguely defined national defense issues. It would amount to a complete government takeover of the U.S. economy. F. Signing an Executive Order on July 6, 2012 giving himself and the Executive branch the power to control all methods of communications in the United States based on a Presidential declaration of a national emergency. G. Signing an Executive Order on January 6, 2013 that contained 23 actions designed to limit the individual right to keep and bear arms guaranteed by the Second Amendment to the Constitution. H. Amending portions of the Affordable Healthcare Act and other laws passed by Congress without Congressional approval as required by Article 1 of the Constitution. I. Issuing Executive orders in January 2014 amending the HIPPA law to allow the turning over of confidential medical records to Federal agencies if there is any information to be used to add individuals to the NICS list to prohibit them from purchasing firearms. J. Having the EPA impose regulations on the coal industry that will force many utility companies and coal mines out of business. This will cost the U.S. economy thousands of jobs and dramatically increase the cost of energy to the public. This is being done without Congressional approval. K. Hindering the ability of the U.S. Border Patrol Agency to not only stop illegal immigration, but to stop human and drug trafficking. L. Removing the work requirement from welfare reform legislation without Congressional approval. A. Using Executive privilege to block Congress from getting documents relating to the DOJ’s Operation Fast and Furious and the death of U.S. Border Patrol Brian Terry. B. Had members of his administration provide false information about the act of terrorism committed in Benghazi, Libya on September 11, 2012 and refusing to allow the State Department and other federal agencies to cooperate in the Congressional investigation. C. Falsely labeled the mass murder of American soldiers at Ft. Hood, Texas as “workplace violence” instead of the act of Islamic terrorism it was. D. Falsely labeling the IRS targeting of conservative and Christian groups as a “phony” scandal and refusing to order an active pursuit of the investigation into who was ultimately responsible. E. Refusing to order an independent investigation of the actions of Eric Holder and the DOJ in targeting the phone records of members of the news media. F. Telling the American people on a television show that the NSA was not prying into the emails and phone calls of Americans when the facts prove otherwise. A. Having the Department of Health and Human Services order religious institutions and businesses owned by religious families to provide their employees free contraception and other services that are contrary to their religious beliefs. This is being done under the auspices of the Affordable Health Care Act and violates the religious freedom clauses of the First Amendment. B. Having the military place restrictions on the religious freedom of Chaplains and other members of the military in order to favor gay rights advocates and atheists in violation of the First Amendment. C. Having the military place restrictions on the freedom of speech of members of the military and the civilian employees of the DOD in violation of their rights under the First Amendment. D. Using Executive orders and government agency actions to limit Second Amendment rights. This includes actions by the Veterans Administration to disarm American veterans without due process as required by the Fifth Amendment. E. Having the National Security Agency intercept and monitor the private communications of millions of Americans without a court order and in violation of the Fourth Amendment. F. Joining with foreign governments in lawsuits against sovereign U.S. states to prohibit them from enforcing immigration laws. This is in violation of the Tenth Amendment. G. Filing suits under the Voting Rights Act against sovereign U.S. states to prevent them from enforcing Voter ID laws despite rulings by the Supreme Court upholding these laws. This is another violation of the Tenth Amendment and the balance of powers. H. Having the IRS propose new regulations on conservative 501 (C ) (4) organizations to limit their freedom of speech and political activities during election cycles in violation of the First Amendment to the Constitution. I. Having the FCC prepare new rules on internet neutrality in violation of the ruling by the U.S. Supreme Court striking down such regulations. J. Having the FCC institute a plan to place agents in newsrooms of radio and television stations as well as print media to monitor whether they are providing the “proper” news content to the public, a direct violation of the First Amendment to the Constitution. K. Having the Secretary of State sign the U.N. Small Arms Treaty despite the opposition of a majority of the U.S. Senate and with full awareness that the implementation of the treaty would violate the Second Amendment rights of American citizens. A. In the name of “political correctness,” he imposed unnecessary and dangerous rules of engagement on our troops in combat causing them to lose offensive and defensive capabilities and putting them in danger. Many American service personnel have been killed or wounded as a result of this policy. B. Releasing the identity of American military personnel and units engaged in dangerous and secret operations such as the killing of Osama bin Laden by Navy Seal team 6. C. Article 1, Section 8 of the Constitution gives Congress the exclusive power to declare war. Yet, without consulting Congress President Obama ordered the American military into action in Libya. D. Having the Attorney General tell Secretaries of State that they do not have to comply with the Federal law requiring states to timely send absentee ballots to military personnel. 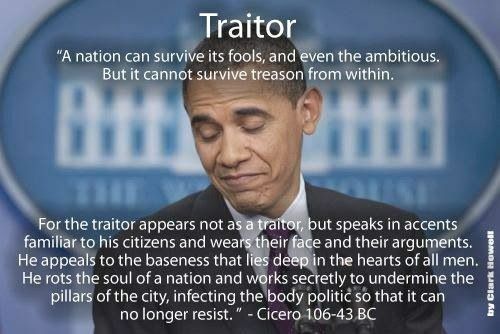 In all of this, Barack Hussein Obama has undermined the integrity of his office, has brought disrepute on the Presidency, has betrayed his trust as President and has acted in a manner subversive of the rule of law and justice, to the manifest injury of the people of the United States. Wherefore, Barack Hussein Obama, by such conduct, warrants impeachment and trial, and removal from office and disqualification to hold and enjoy any office of honor, trust or profit under the United States.